A seemingly fully-assembled logic board —with most of its attached silicon unseen under metal shielding —said to be destined for Apple's next-generation iPhone surfaced on Thursday in a new set of photos from the Far East. A number of smaller chips and connectors can be spotted on the part, including what appears to be a NAND array, though the majority of its components are covered. 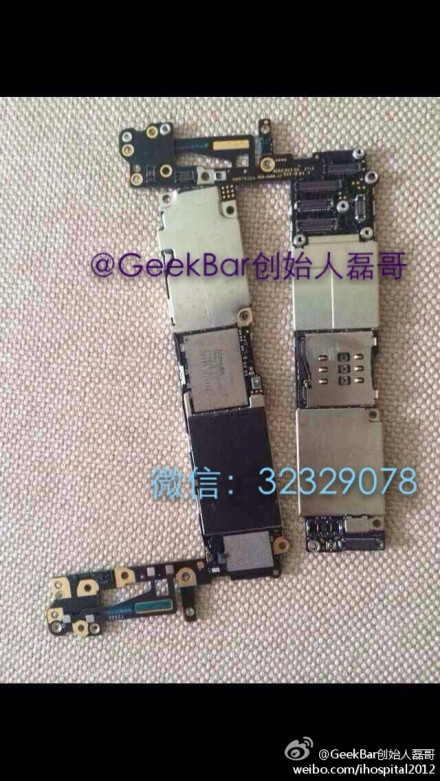 The photo was sourced by Chinese repair firm GeekBar. The overall shape of the board, including mounting locations, matches up with previously seen printed circuit boards that were thought to be intended for the rumored 5.5-inch model. Both that part, as well as another said to be bound for the anticipated 4.7-inch variant, appear larger than the logic boards found in the iPhone 5 series. Many other components apparently being prepared for the next-generation iPhone lineup have been revealed in a series of leaks from Asia in recent weeks. Those include a control cable said to be for the 5.5-inch variant; another flex cable featuring a Lightning connector, microphone and headphone jack; an inlaid Apple logo; and a number of metallic rear casings. Apple is expected to officially announce the 4.7-inch model at a Sept. 9 media event. Production for the 5.5-inch model has repeatedly been rumored to have been delayed thanks to production issues.